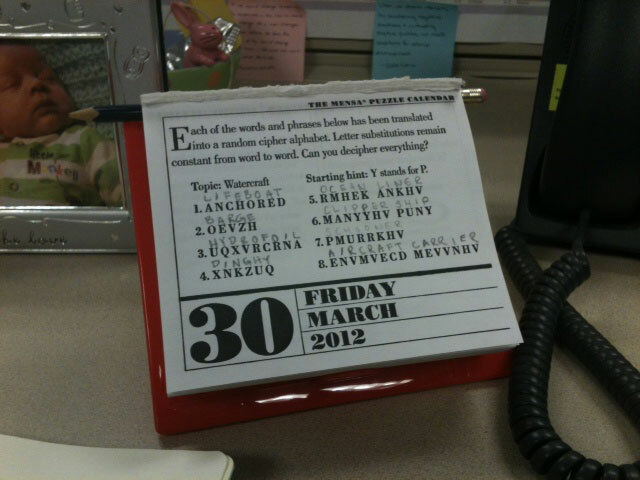 I have a Mensa puzzle calendar. It was a Christmas present, as these things generally are. I really like it. But here’s my problem: if I can solve the problem I suspect it’s too easy. If I can’t solve it, I feel like it’s real Mensa-quality (but then I feel dumb for not being able to solve it). The trick with the above puzzle was to find the one for schooner. Double letters! “It’s not a schooner, it’s a sailboat.” Granted, the puzzle gave a hint that was a double letter…but I didn’t compute that at 7:15 this morning.